If you’re looking for a great alternative to static security guards, look no further than Atlas UK Security’s reputable mobile security patrols. 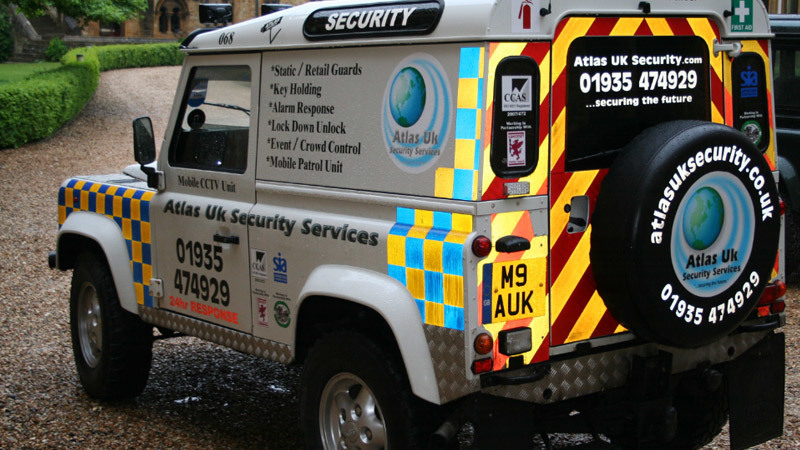 If you’re looking for a great alternative to static security guards, look no further than Atlas UK Security’s reputable mobile security patrols. With this solution you can be sure that our fully licensed guards will not only act as a cost-effective visual deterrent against crime, but will also offer security beyond their fixed locations in order to maintain total security throughout every inch of your premises. We provide Fully Uniformed Guards and Marked Patrols Vehicles who are able to cover a multitude of tasks including: Internal Patrols, Ability to Cover Vast/Unsafe Areas, Quick Response to Incidents, High visibility boards at entrance and exit points, we can provide guards to undertake risk assessment, Health and Safety trained guards, Full Site Management. We recognise that visibility is paramount, so when our mobile security supervisor arrives on-site each day they will be fully uniformed and in a marked patrol vehicle. Understanding that opportunists often take advantage of larger areas, with this package Atlas UK Security’s officers can provide coverage for greater expanses at excellent value for money. Covering open areas like schools and parks, areas with a restricted line of vision such as warehouses and large industrial yards and those too dangerous to monitor on foot, no task is too much for Atlas UK Security. This flexibility and our excellent line of expertise means we can deliver extensively planned services so you can tailor your mobile security package to suit the exact needs of your business. As one of the South-West’s leading security companies we will not just deliver these services, our security mobile patrols will stop at nothing to protect your business by providing an unbeatable deterrence against crime. To ensure your organisation is completely safeguarded, we will supply security guards that are allocated specifically to the role you require to guarantee the efficiency of the services they deliver. Atlas UK Security can also offer you internal security patrols, where the mobile security officer will be permitted to enter your premises with their own set of keys in order to patrol your building as well as its outdoor perimeter. This will ensure all fixtures including windows and doors are locked to deter from crime for complete peace of mind once you have left work for the day. Hire mobile security patrols with Atlas UK Security and enjoy a service that considerably lowers your risk to crime with impeccable and efficient security guards that ensure your company is completely safeguarded. Our friendly team can help assess your security situation and put together a comprehensive protection service specifically to suit your requirements.